Whether it’s linked to conformation or a gait abnormality or a swampy pasture, the shoe loss problem may have met its match in an odd-looking product from Scotland called ShoeSecure. Designed by an equestrian entrepreneur with the help of a world champion farrier, and used by a world champion reiner, the new product launched in the USA this summer with a star-studded resume. What do you get when you put together the mind of a determined equestrian entrepreneur with the technical skills and imagination of this year’s world champion farrier? You get a simple-looking molded plastic cup and a couple of studs. Brows arch, eyes roll, and yet...it works. Just ask Tim McQuay in Texas. World Equestrian Games Gold Medalist reiner McQuay is not just a convert, he’s an evangelist. Shoe Secures are plastic shields held in place by studs. They come in turnout (left) and riding (right) models. What is ShoeSecure? A removable thermoplastic shield both protects the heel bulbs of the front feet and forms an unbroken protection zone over the heels of the shoe. A horse can still reach forward with a hind foot, but it can’t damage the back of the pastern and bulbs and it can’t catch the heels of the shoe. ShoeSecure looks like the simplest thing in the world. But there was nothing simple about getting from the concept to the product that is now showing up in farrier trucks. Scottish equestrian trailblazer Muriel Colquhoun, MBE was not an injection-molding engineer, nor was she a farrier. But that didn’t stop her. ShoeSecures can work with some bar shoes. The studs have flat, square heads that won't interfere alter gait or add excess traction. Geography has a lot to do with both why riders are looking for a product like ShoeSecure and how it came to be. The rolling countryside along the banks of the River Clyde in Renfrewshire, Scotland is a great place to condition event horses, but the thick and often boggy earth puts all horses at risk for stepping on (and pulling off) the fully-fit horseshoes that their farriers fit for them. Yes, even if your horse is shod by 2013 world champion farrier David Varini, you can still lose shoes. Or, in the case of Muriel’s horse, you could still lose shoes on a regular basis. “David was making far too many return trips,” Muriel recalls. "He and his partner Paul Robinson (both World Champions) have helped with ShoeSecure; they were basically fed up coming back into my yard to put lost front shoes back on my horse, Banjo Paterson. I was also using lots of fuel and time going down to their smithy in Ayrshire to get shoes replaced. David doesn't believe in cutting the heels short so I came up with ShoeSecure." Days lost from training are just what horses on a conditioning schedule don’t need. Muriel wouldn’t stand for the inconvenience and potential injury to her horse’s hooves and bulbs; she challenged Varini to help her solve the problem. The farrier prepares the ShoeSecure for the owner, who attaches or removes the shield as needed. 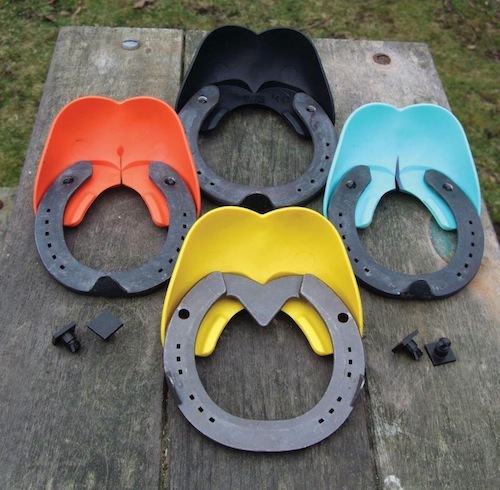 The ShoeSecures were primarily designed for turnout only, however it is simple to modify them for riding. The solution is an adjustable, curved inner surface on the plastic guard, which extends under the shoe and is held in place by special studs threaded through holes in the heels of the shoe. Dirt and mud are locked out by the wrap-around design. It’s important for the farrier to fit the shields to the horse, but then it’s up to the rider when they are used or how long they’re worn. ShoeSecures require a standard drill-and-tap set up, and the farrier will want to make sure that the fit is correct. 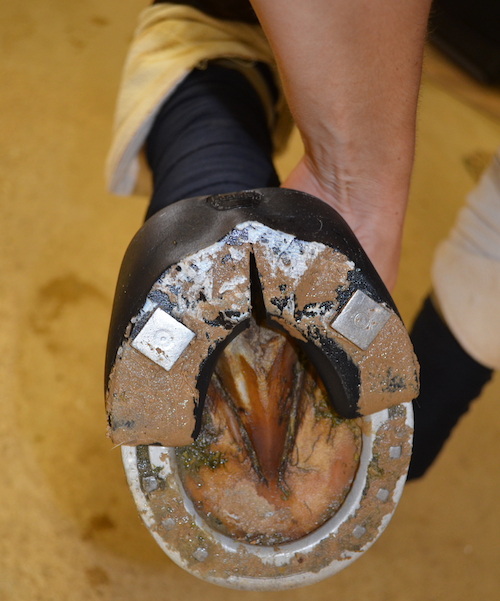 Then the owner takes over, removing or replacing the ShoeSecures as needed or desired for riding in certain arenas or in wet weather or sticky turnout. Some riders might need them only for spring or fall. Horses with gait or conformation problems that affect their timing or foot placement might wear them on the trail or in the arena. 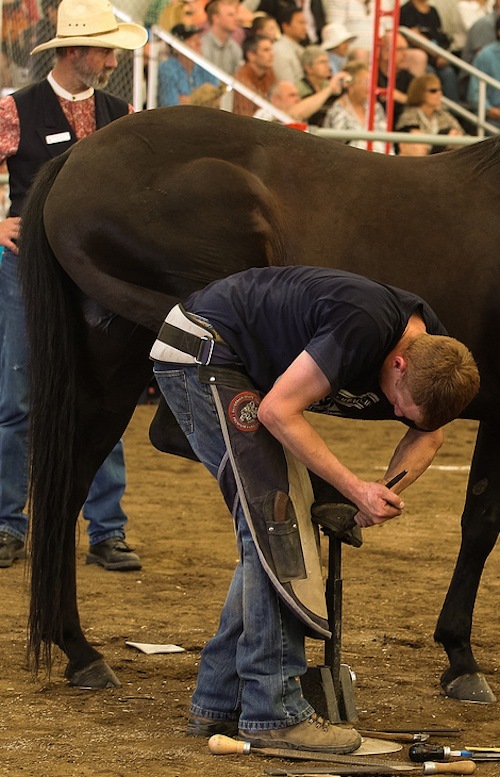 Show organization rules for hoof equipment vary, so riders should check before entering the ring with ShoeSecures on. Muriel Colquhoun went beyond her farrier to test why her product worked. Dr. Tim Watson, Director for International Affairs at the British Equestrian Federation, put her product to the test. He reported: "Gait analysis has shown that the wearing of the shoe shield (Shoe Secure) does not alter the loading of the limb during the weight-bearing or stance phase of the stride. Furthermore, it has no significant effect on the flexion/extension of the forelimb joints during the swing phase of the stride. Everyone loves to watch reining, but whose job is it to go out into the arena and look for lost shoes? During the all-important slide, the horse is required to shift its haunches for a deep descent under the rider’s weight. The hind feet reach forward and s-l-i-i-i-i-i-d-e (on a talented and trained horse, anyway). What sometimes happens next isn’t always pretty. The hind foot easily can glance off the heel of the front shoe, or scrape the back of the pastern, or cut into the heel bulbs. Repeated grabbing on the shoe or heel edge can carry enough torque to rip the shoe right off. 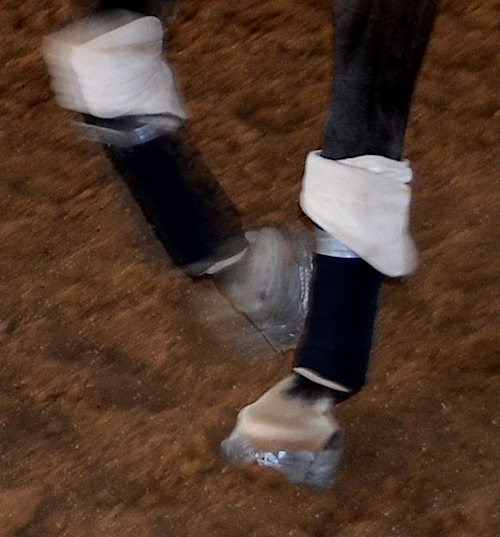 Some reiners short-shoe their horses’ front feet to solve the problem, but that can lead to corns. Some spoon the shoe's heels. Some add acrylic heel patches. World champion Tim McQuay said he tried every product on the market, from the rubber hoof straps used on grand prix jumpers to a parade of over-reach boots. 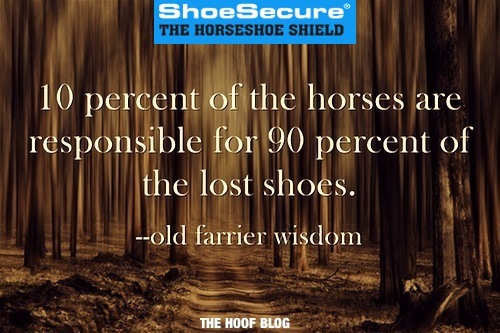 ShoeSecure is sold by a growing list of farrier and tack supply stores around the world. In the USA, farriers, trainers and owners order them from Palm Beach Farrier Supply in Florida, where owner Joy Ream remarked that they were really catching on, especially with the reiners. ShoeSecures sell for approximately US$65 per pair, including studs, and come in black or bright colors. Disclosure of Material Connection: The Hoof Blog (Hoofcare Publishing) received compensation for writing this post. However, Hoofcare Publishing has no material connection to the brands, products, or services mentioned, other than products and services of Hoofcare Publishing. I am disclosing this in accordance with the Federal Trade Commission’s 16 CFR, Part 255: Guides Concerning the Use of Endorsements and Testimonials in Advertising. Case Follow-up: How's the Swiss Cheese Hoof Wall?